What’s new in Super Core? 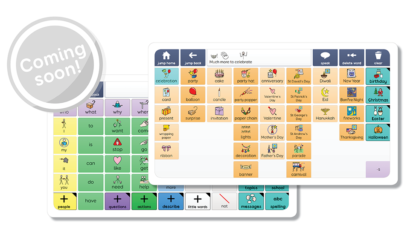 We are constantly developing and improving Super Core, our core vocabulary used by many children to be successful with AAC. This January we made a number of changes to make Super Core even more powerful, and even easier to learn and use. 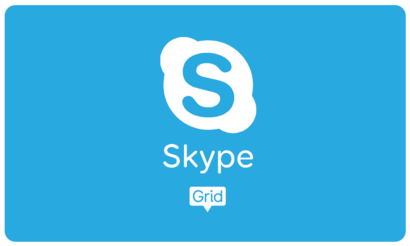 Now that Super Core is available in two sizes, we have renamed our original grid set Super Core 50. Both Super Core 30 and 50 have exactly the same vocabulary, so you can say all the same words and phrases. The only difference is the number and size of cells on each grid. We’ve added new Widgit symbols and over 400 new words to Super Core – with everything from seasonal holiday topics to additional food and drink items. 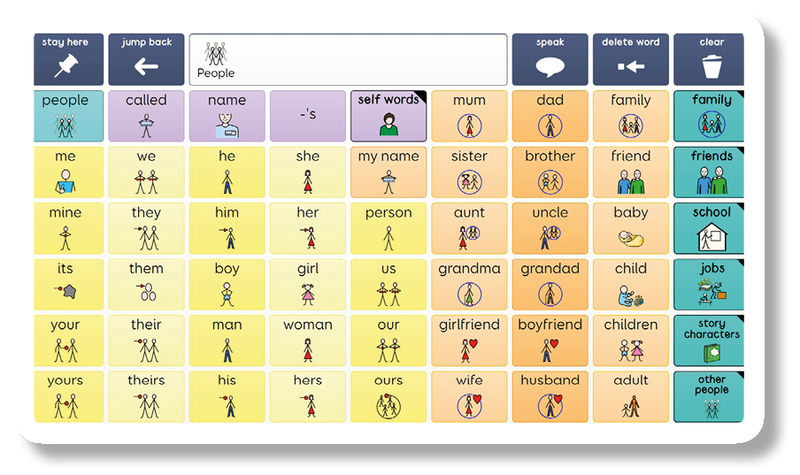 Look out for the new AAC topic grid, that you can add to and personalise too. 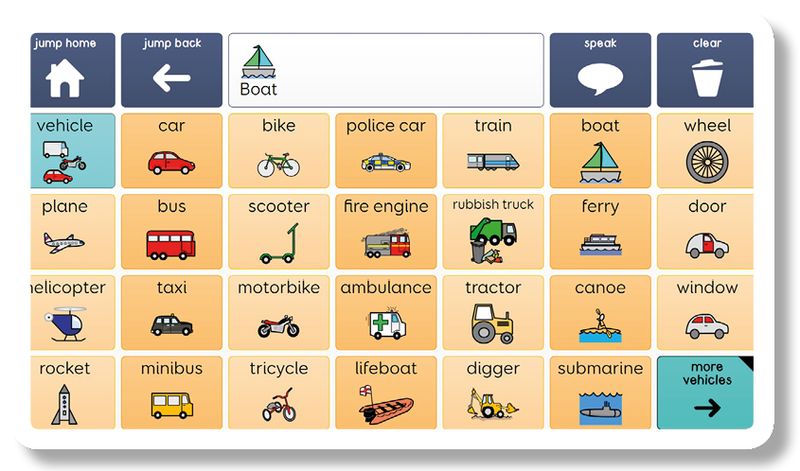 For older children using Super Core there you can also access vocabulary for talking about topics like puberty and private body parts, which are hidden by default, but can easily be revealed and edited as needed. You can read more about this in the Super Core manual. Every topic grid now has a label in the top left corner, so you always know where you are. Some of the words on these grids have had to move slightly to make space for new vocabulary, but wherever possible things are kept consistent. 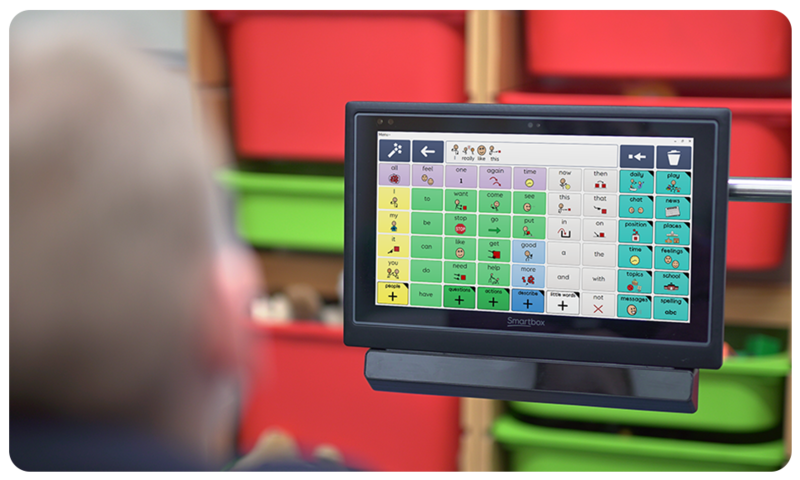 Function cells now have labels on them, to help learners and their communication partners know exactly what a cell is going to do before it is selected. This also helps provide consistent language to use with the learner when teaching the different cell functions. 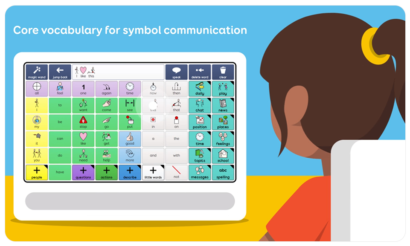 There are new keyboards to explore, including keyboards with word prediction cells for learners who are developing literacy. We’ve made sure that words can be found in consistent locations throughout the Super Core grid sets. For example, if a word appears more than once, it will appear in the same place in each grid to help you learn the location. 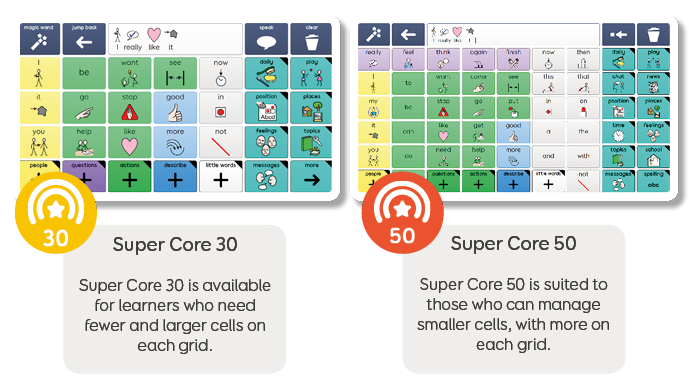 Wherever possible the layouts in Super Core 30 and 50 are also similar, to make it easier to learn if you are working with multiple Super Core users. Words that are similar have been grouped together, with each word linked in meaning to the one above or below it. 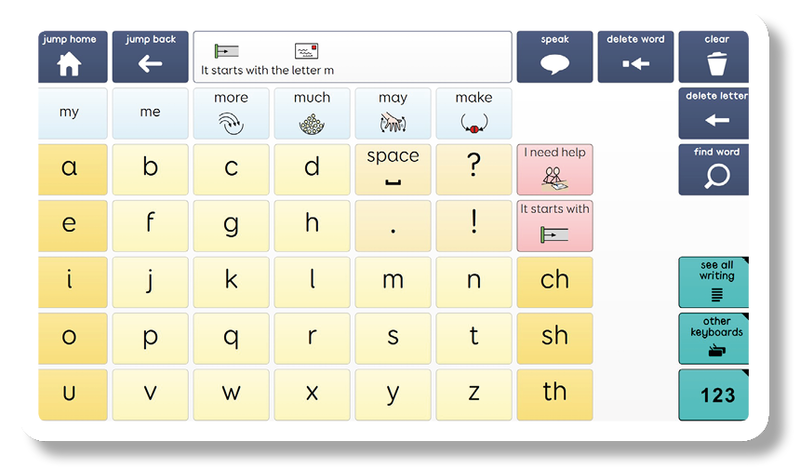 This is designed to help learners find words more easily. For example, in the vehicles grid you’ll find vehicles that fly grouped together in one column, and those that go on water in another. Download the Super Core manual to learn more about these features and how Super Core works.